Published: Aug. 14, 2012 at 11:55 a.m. 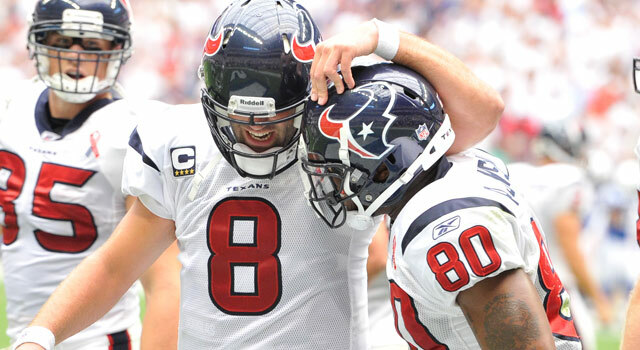 Updated: Aug. 15, 2012 at 07:11 p.m.
Houston Texans QB Matt Schaub (left) and WR Andre Johnson have their sights set on an ambitious goal in 2012. HOUSTON -- One year ago, the Houston Texans were coming off a 6-10 season, with a coach on the ropes and a roster known for underachieving. And now, just 12 months later, it's "Super Bowl or bust?" You bet it is. If you don't believe it, just ask the guys themselves. 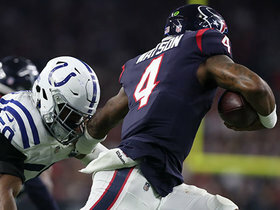 "That's how I feel about it," Texans receiver Andre Johnson told NFL.com when asked if that's a reasonable way to assess the team's approach in 2012. "That's the only reason you play the game. I mean, that's the only reason I play it. You can make the playoffs, go to the AFC championship, (but) if you lose, you're still getting the same thing the guys who didn't make the playoffs got. The ultimate goal is winning the Super Bowl. That's it." You might think his quarterback's outlook would be more measured. It isn't. Based on where these Texans have been and where he thinks they're going, Matt Schaub also gauges "Super Bowl or bust" to be a fair statement. "I think it is," Schaub said as he huddled under a tent after practice to escape the relentless summer heat. "Given where we went last year, the next step is the Super Bowl. We can't win it here in August or September; it's a slow progression. We have to take one at a time, as the cliché goes. But ultimately, we wanna get to that final game in February. That's our goal, and we're not gonna rest until that happens." 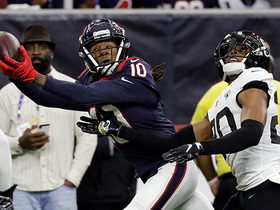 The 2011 season represented a breakthrough for the 10-year-old Texans organization, which marked its first 10-win campaign, first division title, first playoff berth and first playoff victory. For Schaub and Johnson, though, 2011 also represented missed opportunities, maybe even more so than the failed efforts of years past. The quarterback's season ended in Week 10 with a Lisfranc fracture in his right foot. Nagging hamstring issues cost the receiver nine games, though he was able to play (and excel) in the postseason. Both guys are on the older side, having turned 31 in the past six weeks. Both have also dealt with other significant injuries over the past five years. As a result, both firmly understand where they -- and, by extension, their team -- stand. Coach Gary Kubiak is entering his seventh season. Running back Arian Foster turns 26 later this month. Linebacker Brian Cushing is 25. Cornerback Johnathan Joseph is 28. There are younger players -- like defensive end J.J. Watt, 23, and linebacker Brooks Reed, 25 -- who are primed to reach the next level. The implication is clear. "This is our window of opportunity," Johnson said. "Opportunities don't last long in this league; those windows close real fast. We have a great opportunity right now. It's up to us to take advantage of it. It's not gonna happen just by talking about it, and we know that." That's apparent here, in the shadows of Reliant Stadium. The Texans' practice on this, another oppressively muggy morning, is crisp, fast and efficient. Kubiak stops the session twice, gathering the team en masse to explain what he wants in the next period. Then, by all accounts, he gets it. "Everything you do, do it faster!" Kubiak shouts to rookie quarterback Case Keenum at one point. But otherwise, the coach barely raises his voice. It is very much a professional setting. The point is that the group, as a whole, seems to get the line of thinking espoused by Schaub and Johnson, the young-stars-turned-elder-statesmen. 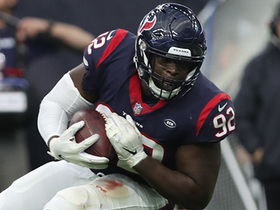 Last year, Johnson went down with a hamstring injury in the first weekend of October and didn't come back until after Thanksgiving, in Week 12. In Week 13, he hurt the other hamstring and missed three more games. Schaub's circumstance was worse. The Lisfranc injury forced him to stay off his feet, so he was chained to the bench, wearing a headset and trying to help, knowing his contributions would be limited to, in essence, mentorship. Schaub, who didn't return to practice until the start of training camp, said his most poignant memory from that period was of watching helplessly from the sideline. "There are always things you can get better at -- little things, the details, the footwork drills," Schaub said when asked how he spent the time away. "But I think the biggest thing for me is, it gave me the reminder to enjoy what we're doing and not take things for granted, because of how quickly it can get taken from you. We have such short careers, the span of time where we can play this game. We have to embrace every opportunity where we can go out there. It really gave me a better appreciation for what we do." In a roundabout way, the story of 2011, which was dominated by major injuries to Schaub, Johnson and former defensive leader Mario Williams (lost for the season in Week 5), has helped fuel the optimism regarding 2012. 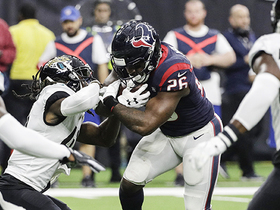 The Texans won 10 games in the regular season, advanced a round in the playoffs and seriously challenged a Baltimore Ravens team that hadn't lost at home all season. That Houston accomplished those things while shuffling three major pieces in and out of the lineup illustrates the depth of talent amassed by Kubiak and general manager Rick Smith. Taking the next step -- from contender to champion -- is tougher, and these guys know that. Still, the players here buy into the idea of building off of 2011. Last fall, Johnson said, "boosted our confidence a lot more; I think it really showed what type of team we had, and we found out about some other players that we really didn't know about." Johnston continued: "It's up to us now to get it done." That means no more excuses. The group that had been perpetually known as Next Year's Darling finally broke through last season. The Texans didn't arrive at this point quite as quickly as they wanted to, as Schaub and Johnson readily admit now. And they know that's left them less time to make the next jump. "We have to have that sense of urgency to go get it," Schaub said. "Nothing's gonna be given to you in this league. We have a tough schedule, yes, but we know we have the type of talent in our locker room where we can go out and beat anyone on any given day. For guys like me and Andre, yeah, we're in Year 9 and 10, but we're hitting our stride, we're hitting our prime. "And we know that window of opportunity is small in this business. The talent level here is so good, we have to embrace every opportunity we have to go play." If the Texans don't win it all this year, the wheels won't come careening off the whole operation. But the players have taught themselves to think they might. Because after the year Johnson and Schaub just had, really, you never know.